What better way to start this blog than with the classic story of love and loss during World War II? On Thursday, August 12, we went to see Rodgers & Hammerstein’s South Pacific at the Four Seasons Centre for the Performing Arts. To properly prepare ourselves for a musical night, we stopped for dinner at Sushi Time to split a bottle of wine and some raw fish. It’s been a love hate relationship with this particular location for a while now. While we enjoy the meal, the service always seems to be sub par. Thankfully all was right last night and our waitress was on the ball. We split a bottle of red wine (a must) and a variety of sushi while discussing our expectations for the show… and how to approach our first blog post… before heading down the street to the theatre. 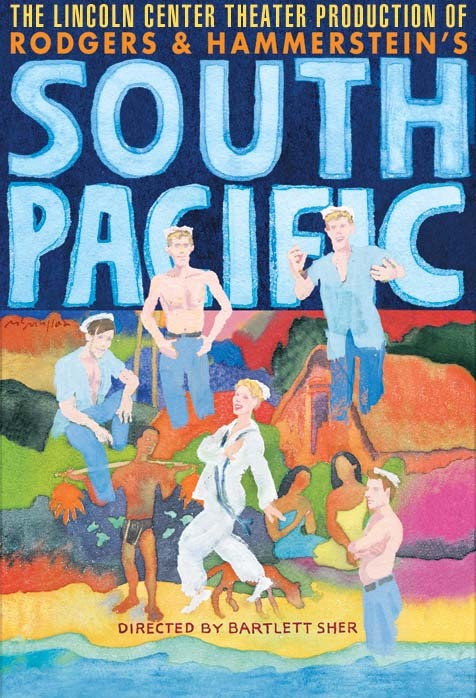 Generally considered to be one of the greatest musicals in history, South Pacific weaves together the stories of a motley crew of sailors, nurses, officers, natives and a fugitive Frenchman all looking for love and solace on an island in the South Pacific. While battling the Japanese and their own racial prejudices, each character is forced to take a hard look at themselves and decide what is most important. We have only been to the Four Seasons Centre for the Performing Arts once before, but hold the theatre in high regard. The seats are comfortable (but not too comfortable that you find yourself dozing off during scene changes) and it’s fairly spacious. Our seats last night were in row V, near the back of the theatre, in a secluded section for just the two of us, which created an eerie familiarity to Muppet favourites Statler and Waldorf. Our biggest issue with these productions is the strength and quality of the singing. We have seen some questionable casting choices throughout our theatre going, so it’s always nice to be presented with theatre veterans who can carry the show without trouble. Carmen Cusack falls easily into the role of Ensign Nellie Forbush, a self-proclaimed hick from Littlerock with a booming, soulful voice who innocently catches the eye of Frenchman Emile de Becque (played by Jason Howard). Despite cautionary tales about de Becque’s questionable history, Nellie can’t escape his charm and falls madly in love with him. But it was the allure of Anderson Davis as Lt. Joseph Cable that grabbed our attention. The moment he stepped onto the stage over the fake beach in a pair of aviators and a leather jacket, we swooned. I believe there was even a hushed “Who is that?” muttered in between school girl sighs. And that voice! Of course, Jodi Kimura as Bloody Mary and Matthew Saldivar as Luther Billis had the audience in stitches with their comedic and enthusiastic performances. But it was the stereotypical little old lady struggling with the candy wrapper seated behind us that brought tears to our eyes as the result of uncontrollable silent laughter. Her struggle lasted a good seven minutes as she desperately tried to break into a package enclosed with very loud and crinkly plastic wrap. Just when you thought she had stopped… it would start again, inflicting another fit of muffled giggles. It wasn’t until an usher asked her to stop and the first act ended that we were able to collect ourselves. All in all, Dancap’s reinvention of South Pacific was well done. The production and key players all added to the romance, splendour and beauty that is South Pacific. This is a limited engagement in Toronto but is the perfect ending to the Summer. Having seen all Dancap stage productions (most recently, Miss Saigon, Toxic Avenger and Jersey Boys), they’ve exceeded our expectations each and everytime. Every performer is strong in not only acting but singing as well. Their ability to transport us from our seats right into the heart of the story in front of us makes each ticket well worth the going rate. If you haven’t seen South Pacific yet, what are you waiting for?